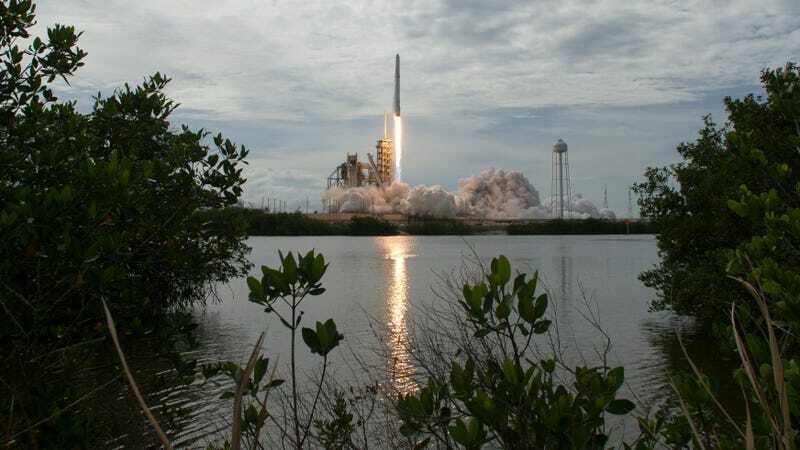 The U.S. Federal Communications Commission has authorized part of SpaceX’s application to build and launch more than 7,500 satellites, according to a press release. These would make up part of a proposed constellation of almost 12,000 satellites designed to improve internet connectivity. Satellite communications currently rely on satellites in geostationary orbit, 36,000 kilometers (22,369 miles) above the ground, that maintain a fixed position relative to Earth. But SpaceX’s 12,000 satellites would improve connectivity using non-geostationary (NGSO) satellites, which orbit closer and move relative to the Earth’s surface. The application contains the details of SpaceX’s Starlink program, announced in 2015. The 7,518 satellites approved by the FCC will orbit between 335 and 346 kilometers (208 and 215 miles) up, and another 4,425 satellites would orbit between 1,110 and 1,325 kilometers (683.5 and 823.3 miles) above the Earth’s surface. The International Space Station orbits at 409 kilometers (254 miles), for comparison. SpaceX hopes the system will increase internet coverage in rural and remote areas. The idea is that these smaller, mass-produced satellites will be cheaper, and in orbiting closer to the Earth’s surface, could provide better broadband internet coverage than fewer and more expensive satellites in geostationary orbit. These 12,000 satellites would join two prototype satellites launched by SpaceX earlier this year. The FCC additionally granted authorization to companies Kepler, Telesat, and Leosat to launch 140, 117, and 78 satellites, respectively, as part of their own NGSO constellation programs. The federal agency previously authorized SpaceX’s 4,425 other satellites, as well. SpaceX CEO Elon Musk really wants to launch these satellites, and soon: Just last month, he fired a number of managers over what he deemed as too-slow progress on the project, Reuters reported. Musk hopes to launch some of the satellites in 2019. At the same time, the FCC announced that it will review its orbital debris mitigation rules, hoping to “incorporate improvements in debris mitigation practices into the Commission’s rules.” It’s unclear what those rules are, or if the recently approved satellites will have to follow these rules. There are already more than 500,000 pieces of space junk orbiting the Earth, traveling at speeds of up to 17,500 miles per hour, around 10 times the average speed of a bullet. Anyway, it looks like space internet is really happening, so long as SpaceX can get all of the satellites up and running, and the company’s got competition. Let’s do this, I guess.